Nepal, Yeti Tea Shop, 1983 - Here is a simple photograph, a small sign indicating a tea shop near Kala Patar in the Solo Khumbu. Notably, the name of the tea shop is the "Yeti." Yeti is the local name for what we know as the Abominable Snowman. Ancient lore in this part of the world refers to the Yeti. 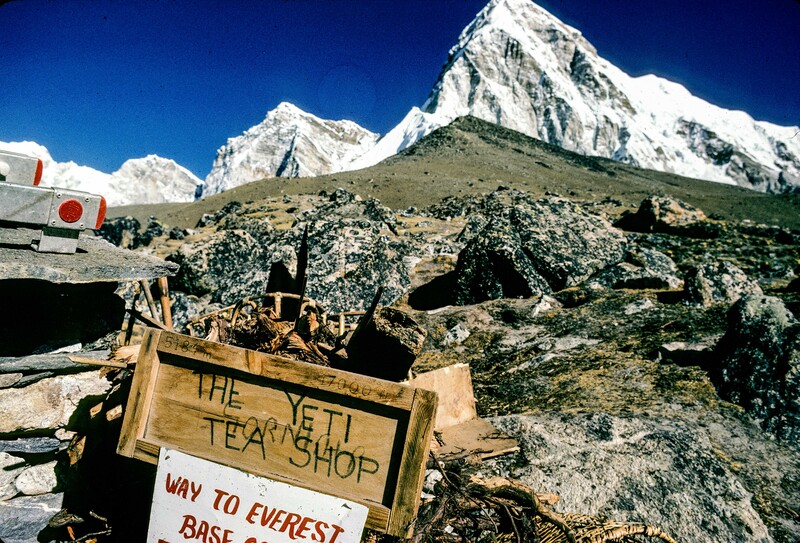 (Supposedly, in Pangboche, not far from this tea shop, there was a Yeti scalp on display!) Many people, including Judith, the Dutch woman who I wooed there, believe in the Yeti to this day. Note the sign. This is the way to Everest Base Camp.